"We are in substantial negotiations with our partners in Europe and those who have lent us. We have obligations towards them," Tsipras said Monday in Cyprus during his first foreign visit as a prime minister. "Right now, there are no other thoughts on the table," he added, answering the question about possible financial aid from Russia. Tsipras also rejected the idea of his country leaving the eurozone, saying anyone who thought small countries within the EU like Greece and Cyprus were not essential, were mistaken. "The EU and eurozone would be both dismembered along their Southeastern flank without Greece and Cyprus," Tsipras said. The Greek prime minister also called for the principle of the ‘troika’ to be replaced, as the mechanism of overseeing the finances by the European Commission, European Central Bank and IMF inspectors drags struggling economies deeper into crisis. 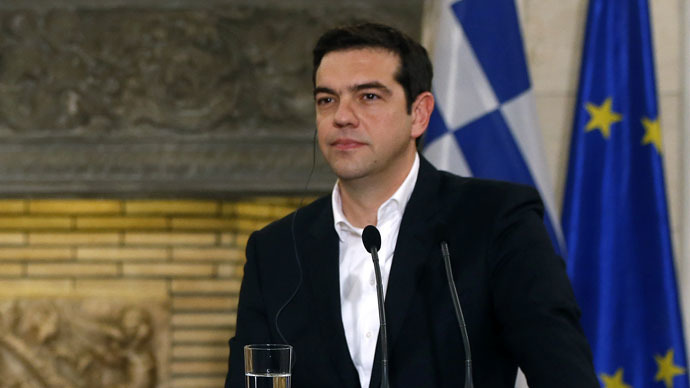 "I believe that this would be a mature and necessary development for Europe," Tsipras said. Germany, the main creditor of EU bailouts, said Monday it sees no need to abandon the ‘troika’ of the European Commission, the International Monetary Fund and the European Central Bank, as they jointly help oversee the changes in the economic outlook of Greece after its bailout. Greek Minister of Finance Yannis Varoufakis said the country doesn’t need a new tranche of financial aid, comparing the policy of the previous government with the behavior of drug addicts. "For the last five years, Greece has been living for the next loan tranche. We have resembled drug addicts craving the next dose," Varoufakis told reporters on Sunday at a news conference in Paris, referring to the country's €240 billion bailout. As the country failed to implement the reforms required by the troika of creditors, it hasn’t received the last tranche of €7.2 billion. Such financial assistance would not help to solve the economic problems of Greece, but would only increase the amount of public debt, he said. The goal of the new government is to achieve a new agreement with Europe. "The debt repayments should be linked to the growth of GDP," he said. Bond yields soared on Friday after Varoufakis said the new government will abandon the bailout program that has provided pensions and public wages for the past five years in exchange for austerity measures that triggered a 25 percent drop in the Greek economy.